Heat oven to 375°F. Spray 1-quart casserole with cooking spray. In 1-quart saucepan, heat pasta sauce, vegetables and chicken to boiling over medium-high heat, stirring frequently. Spoon into casserole. Top evenly with biscuit pieces; sprinkle biscuit pieces with cheese. 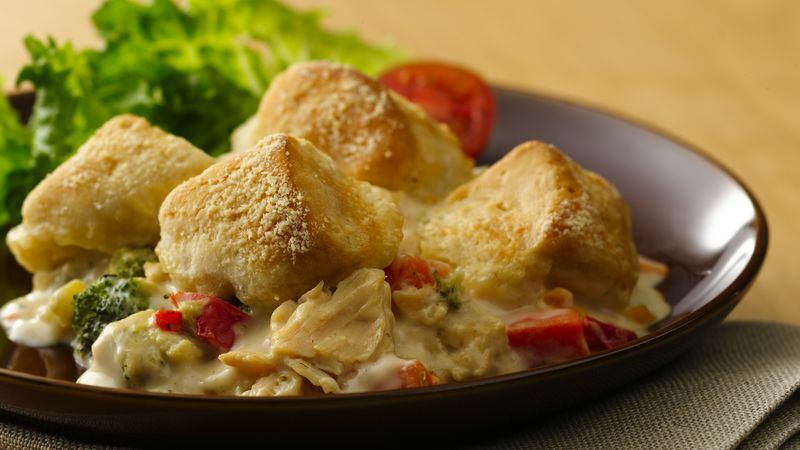 Bake 40 to 45 minutes or until chicken mixture is bubbly and biscuits are deep golden brown. Let stand 10 minutes before serving. Compliment the hearty, hot nature of this dish with a light, fresh side salad or slices of fresh melon.